Click here to go right to the battery category and order now! Coin Cell Lithium - Equivalent to 922-6476. Meets or exceeds specifications. The original style of this battery is no longer being produced. We were able to locate a different improved version that fits and works perfectly. It even had the velcro hold down just like the original. This new style is factory fresh! Mac LC 575-630, 630 DOS Comp. Power Mac 7220, 7220 PC Comp. Still not sure which battery you need? Give us a call TOLL FREE 1-877-639-1543 9-6 CST M-F and we will be glad to help you place your order for the correct battery! Changing out a battery is not difficult on most Mac systems. Simply pry off the retainer and pull the battery out. Reverse the procedure with the new battery making sure the + is positioned correctly. Restart your system and reset the date and time and other control panel settings as needed. 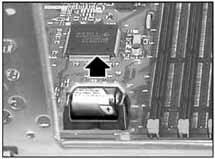 Note 4.5V Batteries are small square and black. They are stuck down with velcro. Simply pull up the old battery and unhook the cable. Reverse the procedure. There is only one way the cable plugs back in. 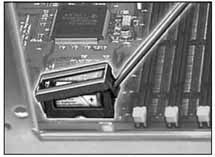 We have illustrated instructions available for iMac Trayload and Slotload systems, available on request with purchase. Call and ask about iMac G4 Flat Panels. We now have backup batteries for iMac G5's, Mac Mini's! G5 Towers & Mac Pro Towers. on it's side.Slide the battery out from the holder. A small screwdriver may help but use caution, the pro's use a small plastic non conductive tool. A plastic knife or ice cream stick would be a decent and safer substitute for a removal tool. IMPORTANT: Slide the new battery in, making sure the + POSITIVE symbol shows up. While extremely rare, it is possible for an improperly installed battery to explode. Button up and restart your computer. Using preferences, reset the clock and check your other settings. Batteries contain chemicals that may be harmful to the environment. You should dispose of used batteries at one of the recycling centers. Startup Disk. Always reset your startup disk. Your system may not boot well or give you the flashing question mark if it gets confused. Date & Time. First, choose your time zone, then set the date and time. Memory - Mac OS 8.5 and later will usually set this automatically. Set your cache to a Meg if you have plenty and 1 meg over on virtual. Network or AppleTalk. If you're on a network that isn't LocalTalk, you will need to reset your network connection on any Mac with a LocalTalk port. Mouse and Keyboard. You'll need to reset the mouse tracking and double-click speeds, as well as setting the keyboard delay and repeat. Energy Saver or Auto On/Off. Energy saving settings, power-up time, etc. are stored in PRAM and need to be reset. Monitors and Sound or Monitors & Sound. You need to reset speaker volume and monitor bit-depth -- and possibly resolution. I was looking at some of the pram batteries sold by our competition. No one sells batteries for less than we do, and no one sells fresher batteries than we do. I saw a couple who advertised lower prices but by the time you paid shipping and handling you end up paying substantially more. What really bothers me though is some of these low priced specials were lower milliamp batteries. Before buying any 3.6 V Lithium Battery that fit in most of the Macs make sure the batteries you are getting are 1200mah. Remember we import these batteries direct and they are not made before we order. While lithium batteries have a long shelf life, most batteries in the states these days are several years old. Ours are no more than 4 months from the date they were created. When pricing laptop batteries you should always compare the milliamp hour rating (shown as mAH). Sometimes a bargain is not a bargain if it doesn't last long in your laptop. More is always better. We are distributors for the ULTRAlife brand of high quality replacement 3.6V Lithium Battery for the Macintosh! We purchase these batteries factory fresh and have them airfreighted in quantity. The same high quality long lasting and powerful 1200 mAh and our same low $7.88 price includes domestic shipping. Call for quantity discounts. These are exact replacements for Tadiran, Saft, Maxell, Rayovac etc. and meet or exceed OEM specifications. Clicking on any link below will take you to the store. Select the battery category when you arrive and place your order securely. Has your system recently lost its mind? If your clock is not keeping time you need to immediately replace your clock battery. Failure to do so can cause drive errors and loss of data. Lithium Batteries last 3-5 years, and the Alkalines last as little as a year up to 2 years. These are exact replacements for Tadiran, Saft, Maxell, Rayovac etc. and meet or exceed OEM specifications. Click Here to review MacBook, PowerBook and iBook batteries! Click Here to ORDER batteries now! We carry much more than batteries in our online store. Visit http://resale.headgap.com for all your Mac accessory needs! Order securely from a 31 year old company who specializes in quality refurbished Mac and Mac clone computers. We offer a 30 day warranty on all batteries and FREE SHIPPING in the continental U.S. We accept SCHOOL and Institutional P.O.'s! We offer quantity discounts! Call or EMAIL US for quantity pricing! Order securely from our Mac based and hosted systems. We NEVER give out email or other information and your email is used only to send you confirmation. Need more than just batteries? Visit Operator Headgap Systems Store for new and used systems and components. Apple, Macintosh, Mac, iMac, MacBook, MacBook Pro, PowerBook, iBook, Performa, Quadra, & Centris are registered trademarks of Apple Computer.